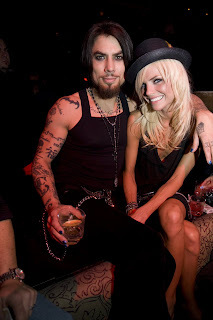 Friday night at TAO Las Vegas saw the stars come out for the 1st Pornstar Ball hosted by rock musician Dave Navarro with number one adult film star Tera Patrick as mistress of ceremonies and guest DJ. Tera arrived with husband Evan Seinfeld and a group of friends. Tera wore a lacy black corset and posed for photos with Evan on the red carpet. Both were extremely loving while posing for photos and the crowd found out why. It was their 5 year wedding anniversary. After photos, Tera headed upstairs into the nightclub to get into the DJ booth and spin a crowd-pleasing set. Dave Navarro arrived at TAO in style being chauffeured by the TAO/LAVO Escalade after his dinner at LAVO. He held court in the dance floor VIP area with his friends including his girlfriend Lindsey Hartley. Dave graciously posed for photos for fans and sipped water throughout the night. With microphones in hand, Navarro and Seinfeld went back and forth giving each other shout outs and welcoming the crowd to Pornstar Ball at TAO. Dave made sure to wish Tera and Evan a Happy Anniversary and the crowd cheered when they found out. Dave even offered to switch places with Evan and be with Tera. At approximately 2am, Wilmer Valderama arrived with his entourage to tear it up at TAO. In his group of friends was MMA fighter Rampage Jackson who seemed to still be celebrating his win two weeks earlier against Vanderlay Silva. Instead of taking his customary spot in the VIP section, Wilmer hung out in the DJ booth and was hyping the crowd up on the mic while drinking from a familiar bottle of Patron. Also spotted at TAO were Joey Fatone who took a table in the moat section with friends, Mavericks owner Mark Cuban and actor Ashton Holmes.